Salâm. Over the course of my growing up, my father spent much time traveling to the middle east on business. His business took him to places like Saudi Arabia, Iraq and Iran at a time when things were much more peaceful in the region. In those days Iran was a beautiful country, and its capital, Tehran, was considered the Paris of the East. Dad taught me the word Salâm, which is how Persians greet each other. So, since today I am teaching you to make a Persian dish, I thought I’d also teach you the only Arabic word I know, Salâm. It is a word common to both Arabic and Farsi (Persian), and translated, literally means “Peace”. So, in my last post, I gave you a recipe for Chelo, which is the crispy rice served with the recipe we will make today, Persian Kebab Koobideh. 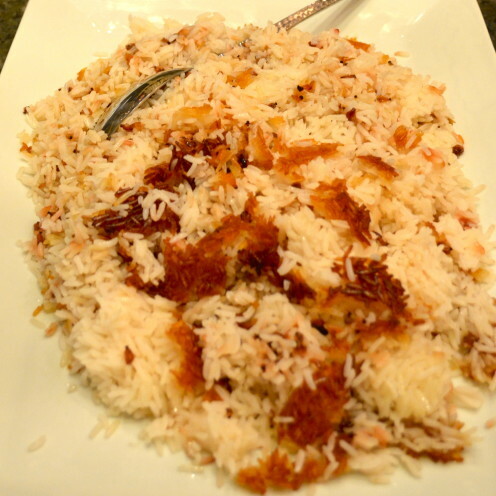 The rice and kebab served together are known as Chelo Kebab. And the kebab alone is called Kebab Koobideh. When I don’t make it myself, I like to order it in my favorite Persian Restaurant, Darya, located in Orange County, near my old stompin’ grounds. 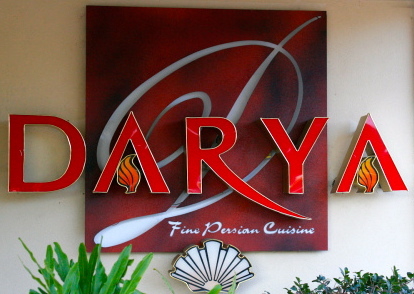 Darya is a terrific restaurant, so if you are ever in the area of South Coast Plaza, do pay them a visit. They are open for both lunch and dinner. But today we will skip the restaurant and make Kebab Koobideh for ourselves. They are juicy strips of charbroiled, seasoned ground beef. Ground lamb or ground chicken can also be used, but I prefer mine made simply with finely ground beef. 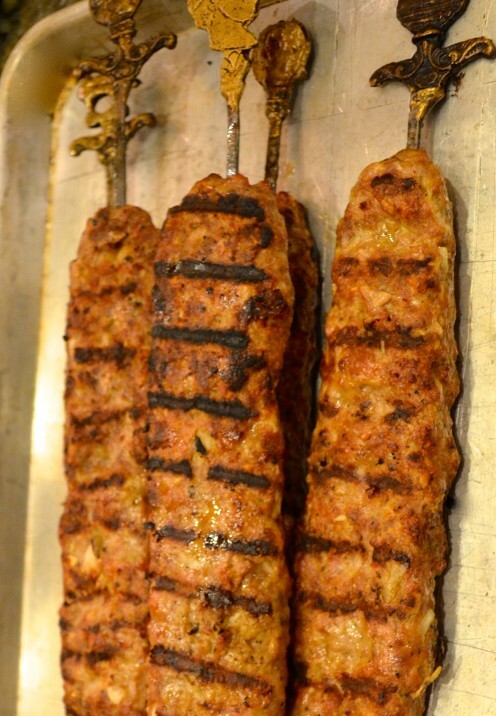 The word “Kebab” actually means to “cook on a fire”, so typically you would cook this dish over an open flame. When I use an open flame or BBQ to cook my kebabs, I also form the meat around skewers and cook them directly on the grill. But, my Persian girlfriend taught me to make this dish by forming the meat in strips on a baking sheet and cooking them in the oven. Either method is permissible and equally delicious. To make the Kebabs, you start by grating 2 large brown onions. Drain the grated onions over a bowl, pressing them to release as much liquid as possible. Discard the juice. 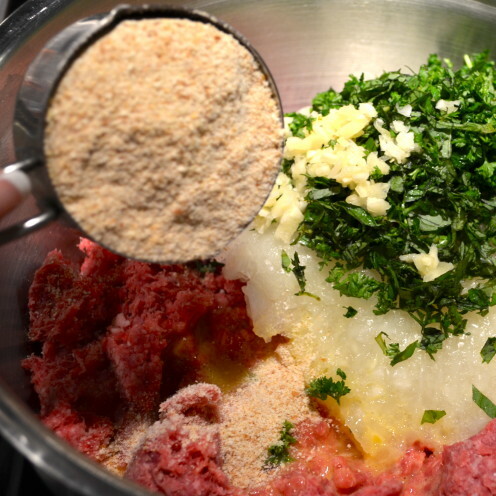 Into a large mixing bowl add 3 pounds finely ground beef that is 80% beef, 20% fat. I ask my butcher to grind the beef twice so it is very finely minced. 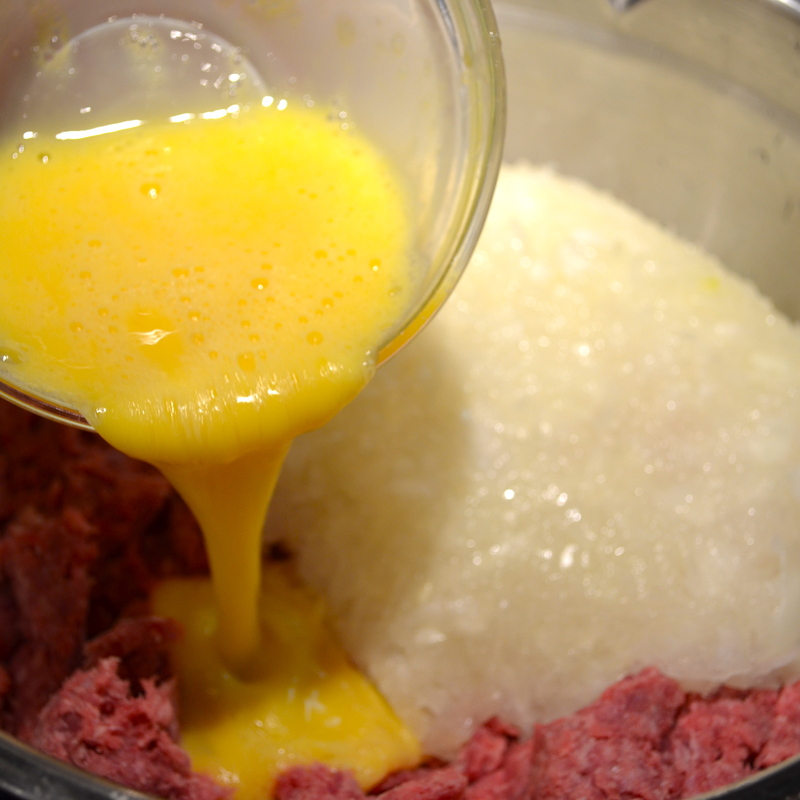 Add the grated onion and 2 large eggs (which have been lightly beaten) into the bowl with the ground beef. 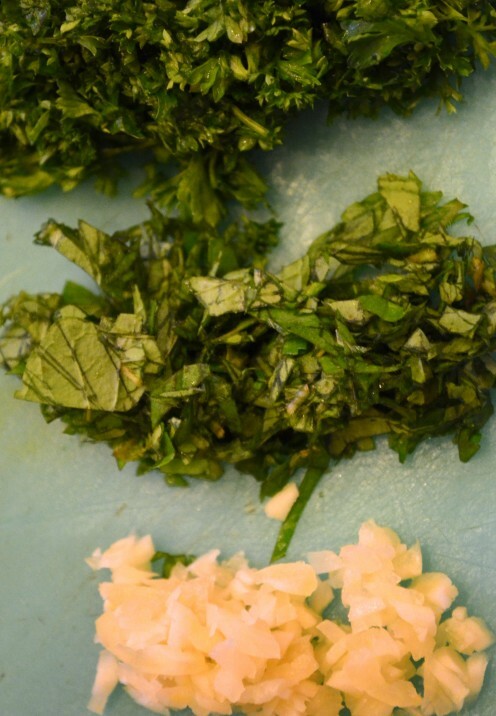 Next, finely mince 1/4 cup fresh parsley, 2 tablespoons fresh mint and 2 cloves of garlic. Add this to the meat mixture as well. Finally, add 1/2 cup dry bread crumbs. Now come the spices which give the Kebab Koobideh its delicious flavor. Add 2 teaspoons salt, 1 teaspoon ground pepper, 1 teaspoon ground turmeric, 1 teaspoon cumin, 1 teaspoon coriander and 2 tablespoons sumac. 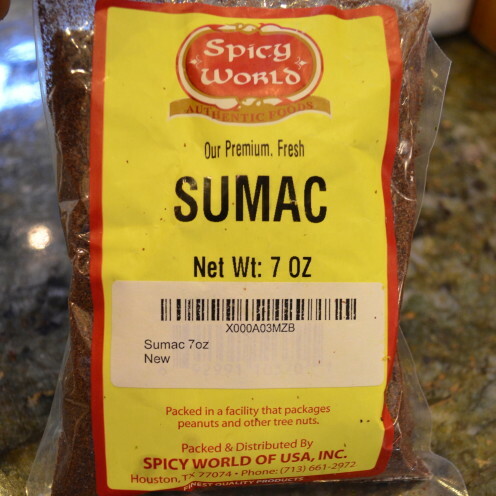 You may be saying, “What the heck is sumac?” Well, sumac is a wonderful spice that is made by grinding up dried sumac berries. It has a distinct tart, sour, lemony flavor that is a vital component to this dish. Sumac will also be sprinkled on the Kebabs, both before and after cooking them. So please go buy yourself some sumac. Plus, because I love sumac so much, I plan to start using it more often, so it will likely be appearing in many more of the recipes I publish. Sumac can be found in Middle Eastern markets or you can buy sumac online here. Now comes the part where you will have to get down and dirty and mix this all up using your hands. Once it is mixed well, you may either elect to place the meat on skewers or form the kebabs on a baking sheet. Either method is fine. 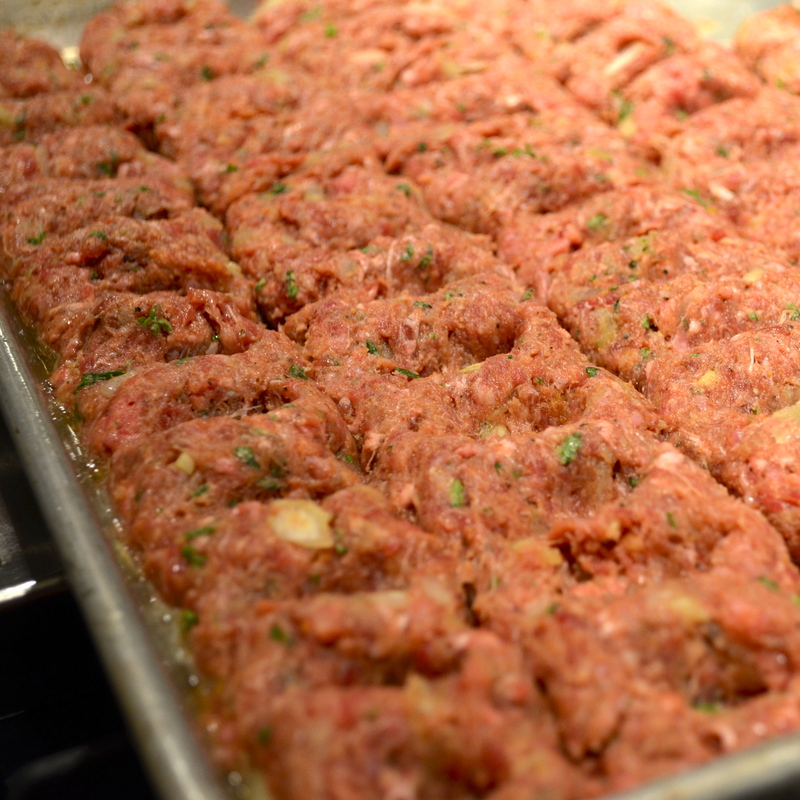 In any case, shape the meat into long strips about 1-1/2″ wide and dust them with sumac. If you elect to grill the kebabs, preheat the grill. Transfer the skewers to the grill and cook over a medium-hot flame for about 4 minutes on each side until the meat is fully cooked. If cooking without skewers, place them on a grill pan and BBQ until fully cooked. Or, the kebabs may be cooked in the oven on the “broil” setting as well. Because these kebabs are made with ground beef, it is advisable to cook them to the well-done stage. The traditional Persian method would be to serve one or two full strips per person. But because my skewers are very long, one full kebab is too much for one person to eat. 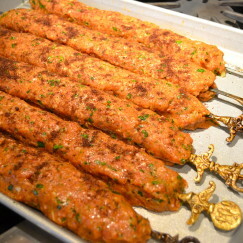 So I typically remove the kebabs from the skewers and transfer them onto a large serving platter. I then cut them in thirds, sprinkle them with more sumac and add a little minced parsley for color. I will have also made the Chelo to serve with the kebabs. This is the Crispy Golden Rice that I showed you how to make in my last post. 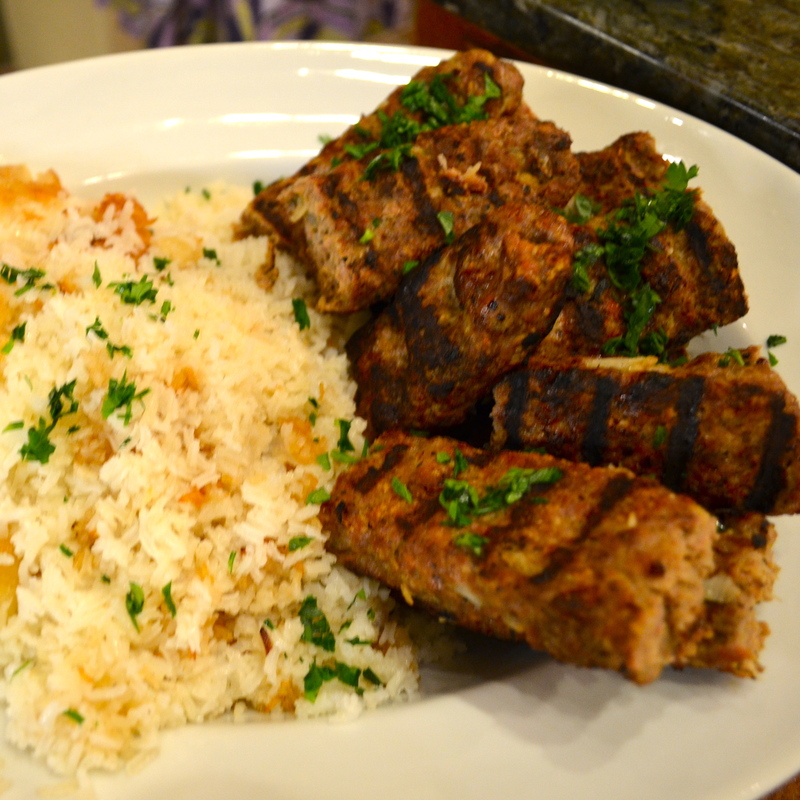 Chelo Kebab is also typically served with grilled whole tomatoes. 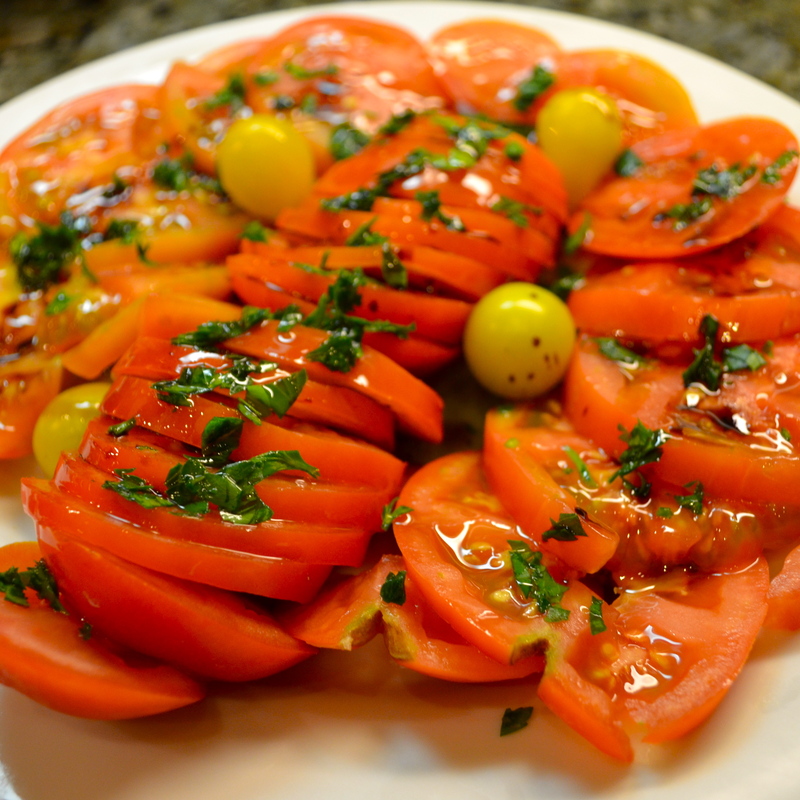 Instead, I usually opt for a salad of fresh tomatoes from my garden, dressed in a little olive oil as my side dish. 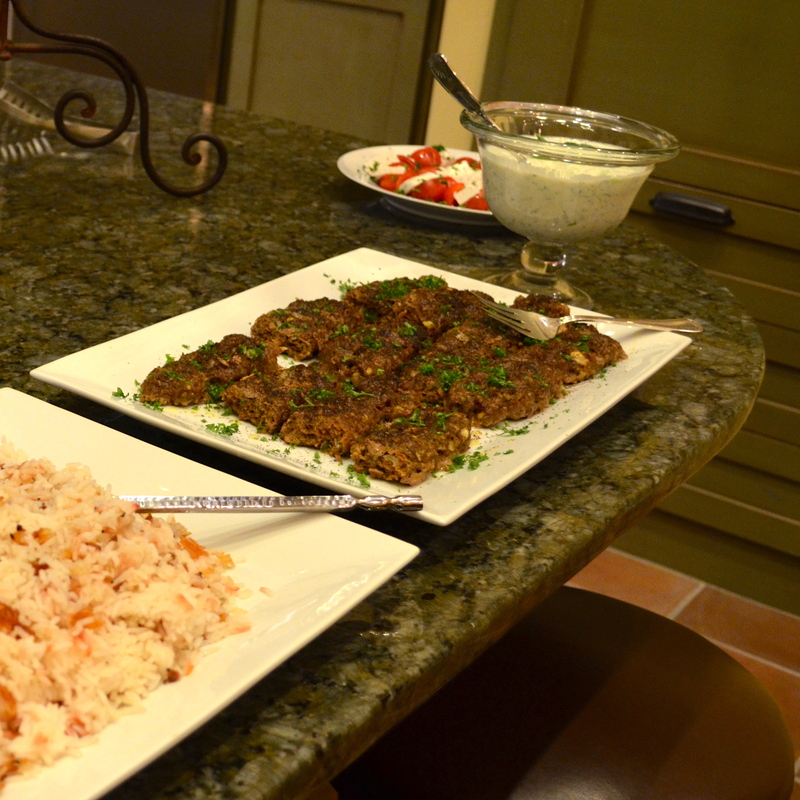 Other times I serve Chelo Kebab with a tomato salad made with cubes of feta or goat cheese, both of which are popular Middle Eastern cheeses. 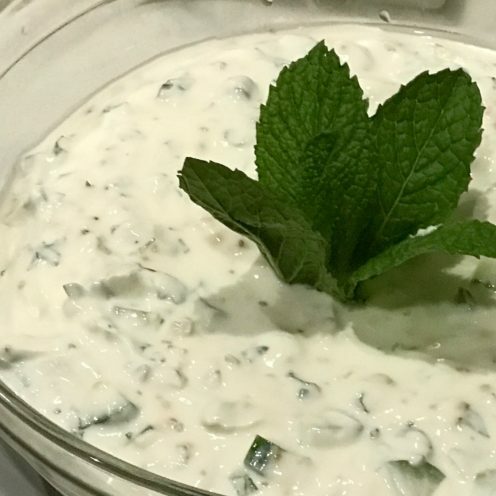 But under no circumstances would I serve Chelo Kebab without the necessary addition of the refreshing Cucumber-Mint Yogurt Sauce. Click here for the recipe. All told, this is the makings of a wonderful Persian feast. 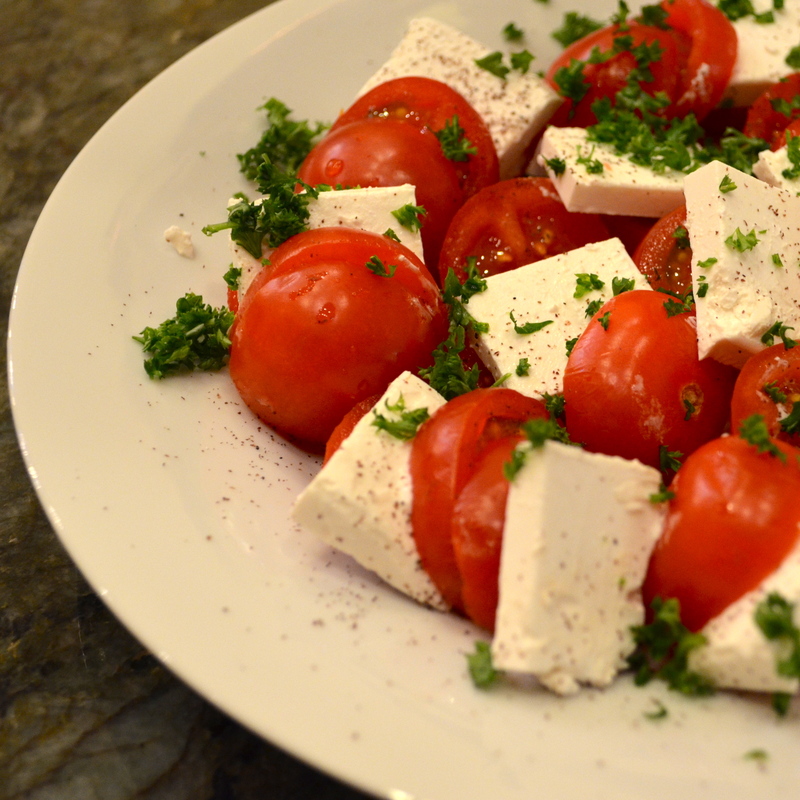 This recipe should be served with steamed Basmati rice, known as Chelo. When these Kebab Koobideh are served with this Persian style rice the dish is called Chelo Kebab. The combination is delicious! 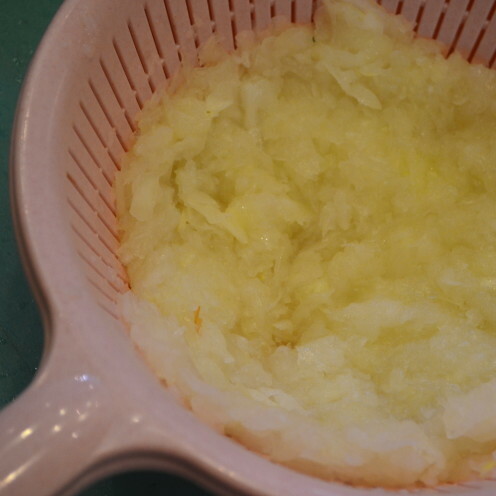 Drain the grated onions through a strainer, pressing the onions to release the juice. 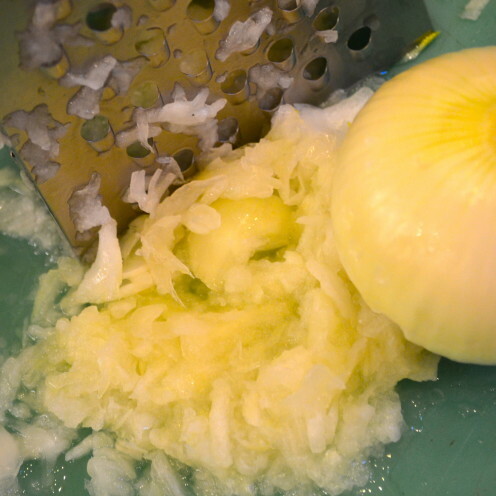 Discard the onion juice and transfer the onions to a large mixing bowl. Add the ground beef, parsley, mint, garlic, eggs, bread crumbs, salt, pepper, turmeric, cumin, coriander and sumac. 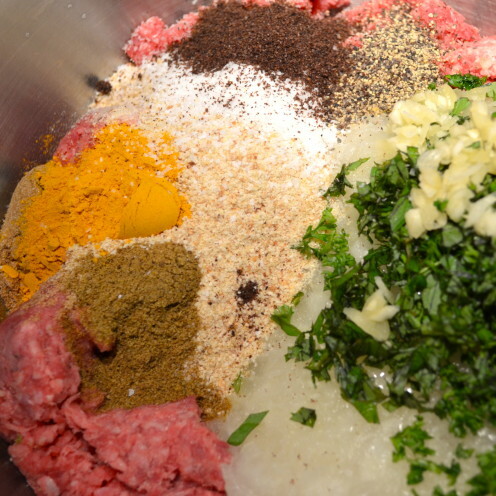 Divide the meat mixture into eighths and shape into long, narrow cylinders. Slide the meat cylinders onto metal skewers, molding and flattening the meat around the skewers. If not using skewers, shape the meat into long cylinders about 1.5 inches wide and place on a baking sheet. Sprinkle the meat with sumac. Place skewers on grill and cook over medium heat about 4 minutes on each side, until meat is thoroughly cooked and lightly browned. 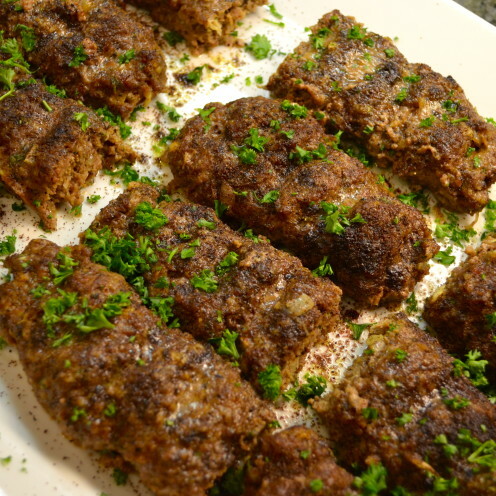 Kebabs can also be cooked on a baking sheet under a broiler in the oven or on a grill pan on the BBQ. 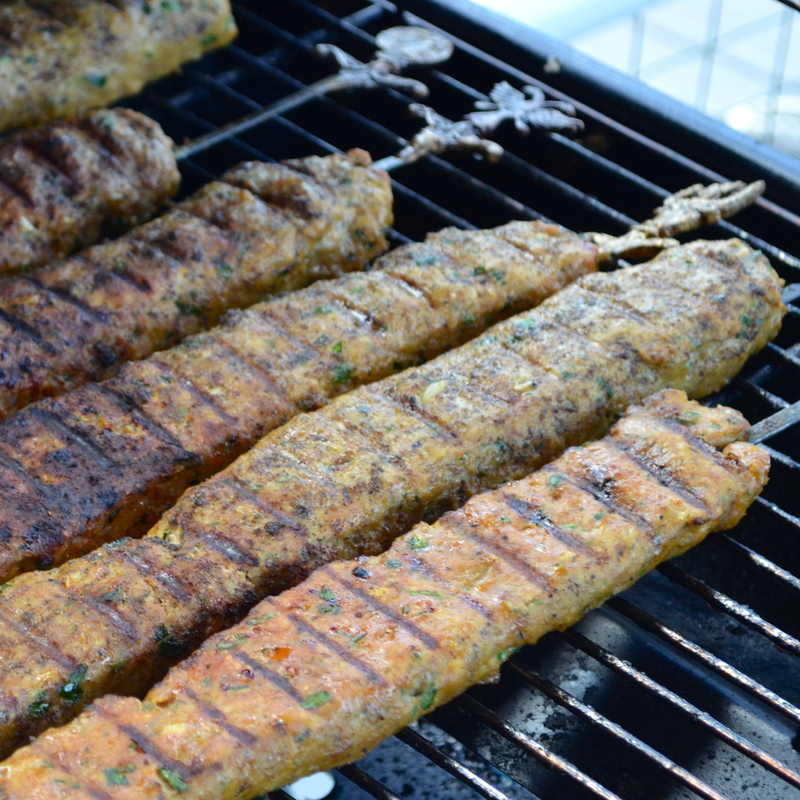 Remove meat from skewers (if using skewers), sprinkle with sumac and serve. All opinions expressed in this post are my own. Unless otherwise credited, all photos are the original property of Celia Becker @ www.AfterOrangeCounty.com and may not be reproduced without specific permission. This post contains affiliate links which help to make this blog possible. Thank you for your support.